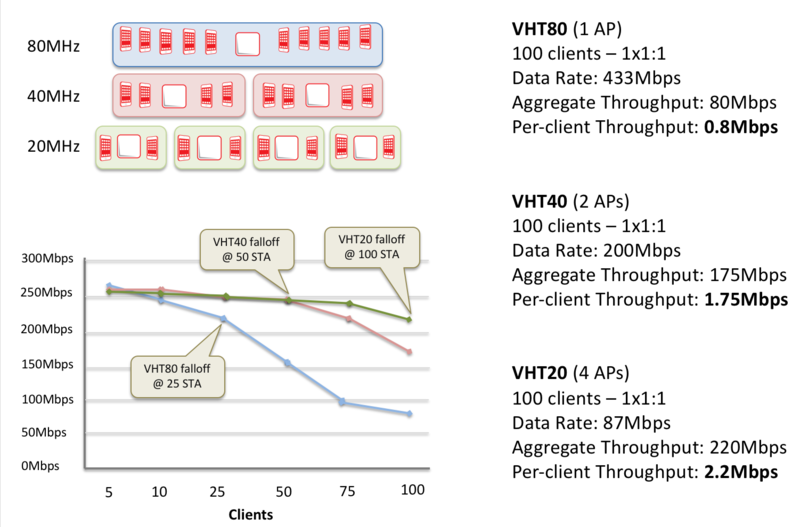 There must be 10Gbps of Wi-Fi throughput hype out there, and I want to explain expected throughput for 11ac and 11ax WLANs in a way that is clear to everyone. 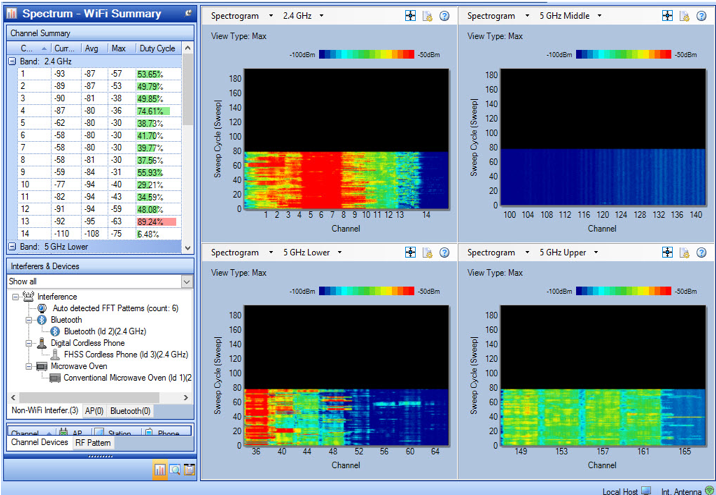 First, we need to understand what can be expected on a 20MHz channel, given a standard assortment of client devices. Here’s a graphic from my friend Andrew Von Nagy at RevolutionWiFi.net that I really like. In this graphic, with all 1×1:1 (1SS) devices, transferring 3Mbps each, the airtime of a clean 20MHz channel is saturated. Airtime saturation happens between 75-80% of channel utilization. This results in a total of ~30Mbps of aggregate throughput. With all 2×2:2 (2SS) clients, you can get 21 devices, transferring 3Mbps each, before the airtime becomes saturated. This scenario would result in ~65Mbps of aggregate throughput. It’s important to note that we can modify the number of clients and the per-client throughput and still achieve the same aggregate throughput limitations due to airtime saturation. For example, if I wanted each device connected to an AP to achieve 2Mbps of throughput, and they were all 1SS devices, then I could have 15 devices actively communicating before the airtime saturates at ~30Mbps (2×15=30). The same modifications can be made with 2SS clients, whereby I could have 2Mbps per client with 32-33 clients before I would have hit airtime saturation at ~65Mbps. A pretty predictable mix of clients in today’s networks is two thirds (2/3) 1SS, one third (1/3) 2SS, and less than 1% 3SS. With this mix, you can expect that the average AP radio, using a clean channel, will saturate somewhere around 45Mbps of throughput in an enterprise environment. If you have two radios in your AP, and both channels have no contention (CCI, ACI, or non-WiFi interference), then you can double this number to 90Mbps, given a standard client mix. If your 2.4GHz radio is experiencing CCI, ACI, or non-WiFi interference, you would expect it to have less than 45Mbps capability, and in reality, if you can achieve 30Mbps (at saturation) on a 2.4GHz radio, you should consider yourself fortunate. That brings “reality” down to about 75Mbps per dual-band AP. Of course, marketers and sales folks may not understand the difference between a data rate and half-duplex throughput, and they may want you to consider only a perfect RF environment, where the math looks like this. In such a ridiculously unrealistic scenario, each of the two clients would have a 1.3Gbps data rate, with a best case of ~650Mbps of throughput, resulting in (if you had no ACI) 1.3Gbps of total throughput on the AP. Using this crazy scenario, sales folks will suggest that customers should buy switches that have 2.5Gbps (or greater) ports. With a dual-band 11ac/n AP, in a heavy-use enterprise scenario, where you are using 20MHz channels to eliminate as much contention as possible, you can expect that both radios’ airtime will be saturated when the throughput across the Ethernet port reached no more than 100Mbps. Keep in mind that control and management frames are pure overhead, and that most data frame sizes are quite small (under 256B) – which further and severely limits throughput. 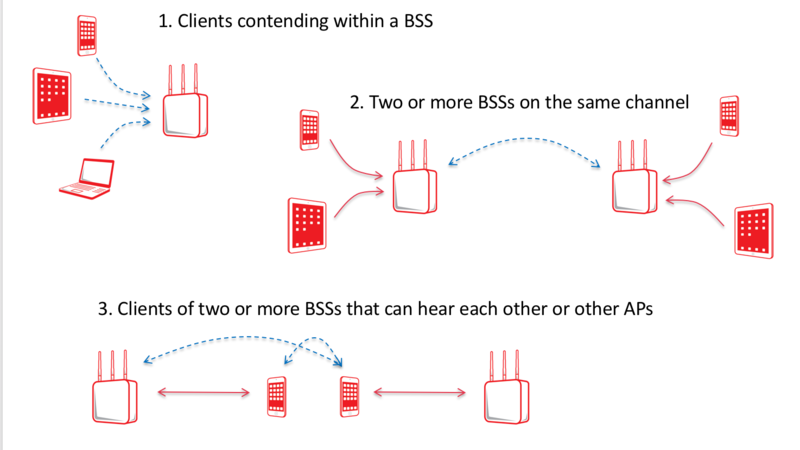 There are three kinds of contention (not counting ACI or non-WiFi interference), that I call Intra-BSS, Inter-BSS, and Client-to-Client (or Client-to-Opposing-AP). There is far more contention on your network than you may think, especially if you didn’t take the time to design and validate it. Contention severely limits throughput. 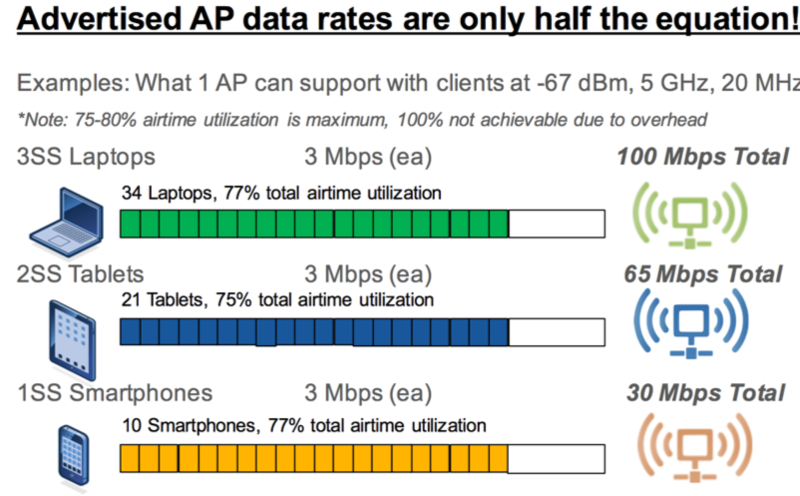 Please explain the math for how you think client devices (alone or as a group) can achieve more than 1Gbps. Beware that they will try to get you to believe that 80MHz channel are good. Further beware of the half-truth of “wider channels give you higher data rates, which uses less airtime per transmission, which gives you more capacity.” It’s wrong. Please show me data from one of your customer’s networks, who has purchased 2.5Gbps (or greater) switches, where they have sustained more than 1Gbps of throughput across an AP for more than 15 minutes. If I personally designed, deployed, and validated a dual-band 11n 2×2:2 infrastructure today, whereby the APs only had 100Mbps back haul links, 95% of enterprises would think that the network was the most amazing thing they’d ever seen. I would take such a low-end, 2×2:2, 11n, well-deployed network over 99% of the very poorly deployed/configured 11ac Wave2 networks in existence today. The hype has already started, and the equipment is still months away from release. So sad. The use of wide channels is extremely inefficient, as you can see in the picture below. Looking at 11ac channel 42 (channel 36 is primary) in the bottom left of the graphic, you can see that while the primary channel is killed, the three secondary channels are barely used. This is because ~75% of WiFi traffic is management, control, and legacy data, which are all transmitted on the primary channel only. Also, the vast majority of client devices today are 11n, so the secondary 40MHz of an 80MHz channel, goes mostly unused. It’s for this very reason that 11ax was created. Efficiency creates system-wide capacity and increased per-client throughput. The 11ax amendment’s primary charter is increasing per-client throughput by 4X, which I believe that it can achieve given: 1) mostly 11ax clients on the network, and 2) an excellent network deployment. That said, it will be likely be around 10 years before most of our client devices are 11ax capable. It takes a REALLY long time to obsolete PHYs and to get rid of older client devices. It doesn’t magically happen in a 3-year technology refresh like sales folks would have you believe. In the graphic below, you can see how use of narrower channels achieve higher per-client throughput. The same will be true of 11ax, and it’s for that reason that 11ax’s OFDMA technology allows for subdividing 20MHz channels into 2MHz, 4MHz, and 8MHz “sub-channels” that we call Resource Units (RUs). Over the useful life of the first generation of 11ax APs (5 years from first launch), I would expect no more than 25% 11ax client penetration into the market. At that point, with an optimally deployed/configured network, you could expect some reasonable amount of efficiency gain due to 11ax client penetration, but nothing game-changing. Even if I put a number on it, like adding 25% to the overall capacity of the network, that would still be a normal use case of 45M (for 5GHz) + 30M (for 2.4GHz) = 75M x 1.25% = 93.75Mbps. Would I need more than Gigabit? No, of course not. The math doesn’t lie. These are the real numbers. If you think otherwise, I challenge you to find a single enterprise network that exceeds these numbers and show me the data. If you can, I will change this blog to reflect what you show me. To help you understand better how to do the math, let me give you a practical example from one of my customers. My customer implemented 3×3:3 APs with 20MHz channels because he had up to 100 active devices in each classroom. His main application was 2Mbps unicast video to 30 clients per classroom. After a successful implementation, he called me reporting that he thought one of his APs was somehow defective. Upon further inquiry, it turns out that his clients were at fault. In that classroom, he was using 30 1SS 11n iPad-1 units, and they were not all able to achieve the 2Mbps unicast video. In other classrooms, he was using 30 2SS 11ac iPad Air 2 units, and they were working fine. His initial confusion was that while the iPad 1 units weren’t working, his Macbook Pro (3SS 11ac) was getting 145Mbps of throughput when all of the students had left the classroom, and so it seemed to be working great. Imagine that. The math worked. And it will work for you too.